Jazz World Trios crosses the lines and beautifully blends the sounds of world music with Cuban jazz, Brazilian jazz, Latin jazz, American blues, African jazz,and contemporary American jazz. It is a most unusual and exciting collection of 6 original songs with a each having a long, innovative play time. The song, “Baiao Granfino” is a great work in harmony and imagery. Each song is unique, and each song is different. Weinstein, Bourell, Cardona, Lubambo, Baptista, Debriano, and Blackman each contribute to joint sharing of musical compositions, and each contributes some outstanding jazz motifs. 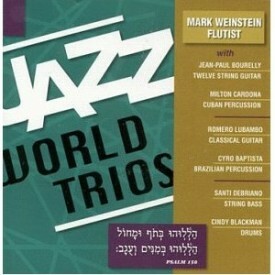 This CD showcases the great flute talent of Mark Weinstein and is sure to please jazz flute listeners. Mark Weinstein is always a treat to listen to, and in this world music collection, he is in top form. Every musician on this CD performs well, and with style, feeling, and imagination. A highly innovative collection, this CD will attract many new listeners to the sound of Mark Weinstein. In a very special way, Jazz World Trios is a classic of contemporary jazz, and a must-have for the jazz listeners’ library. A top-notch recording with something for everybody. Five stars. In the opener, “Eleggua,” Weinstein plays as though traveling through a wilderness, accompanied by two observant journey mates. Jean-Paul Bourelly’s guitar lays a serene melody over Milton Cardona’s walking percussion. It is a cross between a hypnotic safari sound and soft folk rock. This track and “Babalu Aye” utilize various rhythm techniques that were used in worship and calling the two named orishas to solicit safe travels and healing. Weinstein travels to Northern Brazil for the Luis Gonzaga composition, “Baiao Granfino.” Romero Lubambo joins him on classical guitar along with Cyro Baptista’s Brazilian percussion. The tempos change from mild to lively back to mellow again. Lubambo performs a stunning solo just short of the close. Santi Debriano exemplary string bass opens the quiet “LKC Blues” with great style for Weinstein to tell his story. Don’t expect big-city grandeur; the rural influence shapes this track. Cindy Blackman expertly handles rum duty and one would expect no less from her immense talent. Perhaps this is intellectual blues as it prompts one to think rather than lament. This trio also performs the last track, “Pero Como El Amor,” which is probably the most hypnotic and thoughtful of the entire disc. Lubambo’s guitar solo sends a romantic touch throughout the lovely bossa nova, “Nos E O Mar,” composed by Roberto Menescal and Ronaldo Boscoli. Baptista gently supports his band mates but builds a stronger more pronounced rhythm right before the track’s close.Weinstein beautifully interprets this musical form quite differently from most, utilizing the gentler side. These lengthy tracks exhibit versatility from Mark Weinstein and the other musicians. Consistent is the quiet depth in each composition, which is rewarding to listeners who focus on what they hear. Weinstein has come up with a very interesting concept. Using the talents of six international musicians, he formed three trio to represent compositions depicting the African influence on the USA, the Caribbean, and Brazil. This mix results in an intriguing display of rhythmic music that has infused in to it all of the concepts of Jazz along with the territorial elements of the respective geographic areas. As a flutist Weinstein typically soars over the rhythms of the trio members. Two of his trios use guitar and percussion, while the third uses bass and percussion to propel the infectious selections with highly spirited music. The opening “Eleggua” features Bourelly on twelve-string guitar, while Cardona plays Cuban percussion. 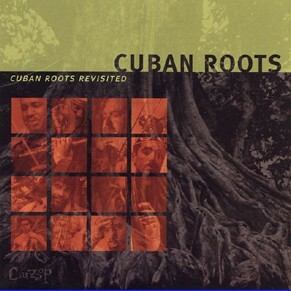 This selection concentrates on the Cuban sub region of the Caribbean and the influence African music had on it. The other selection by this trio, “Babula Aye,” reflects the Haitian side of the equation. Africa not only influenced the music of these islands, it had an indelible impact on the religion of the people that not coincidentally show up in the music. Two distinct areas of Brazil are presented featuring Lubambo on classical guitar and Baptista on Brazilian percussion. They present the Northeast area’s music on “Baiao Granfino” and the sounds of Rio on “Nos e o Mar.” Given the enormous size of Brazil, it is no surprise to find musical and well as cultural differences. The beat of the Northeast is quite different from the Cariocan samba, and Weinstein’s has captured the distinction quite well. Rio’s music has more love built into the songs, while you can hear in the music of the outer regions more of an attempt to cast off the day to day problems that weigh on the people. The USA influenced part of the set features bassist Debriano and drummer Blackman. Their program reflects both the rural side of the the equation, represented here by the blues, and the urban side, with its recognizable big city associations. Weinstein, adaptability on these varying styles is impressive. He jumps right in the blues with assuredness that is driven by the excellent rhythms put down by the other two. The urban tune “Pero Como El Amor” displays great bass/drum interplay with Weinstein’ melodic yet penetrating flute tunes. Conceptually and musically this is a very successful project. Weinstein has taken a point and proven it conclusively in a way that is most enjoyable to hear. I was very impressed with this recording’s execution, originality and spirit.